This week’s new arrivals: Cats out-numbering dogs 4 to 1 this week! Looks like these new furry family members are going to all be spoiled rotten! 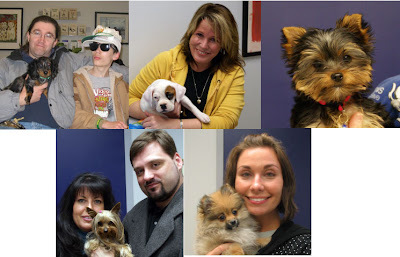 This entry was posted in new arrivals, Pepper, Pumpkin, Sawyer, Shea, Shelby on March 29, 2008 by yourfriends. I feel better now, Mommy! Thanks! Hi my name is Tiffani, and I’m a 14 year old shepherd mix. Several years ago, I tore the cruciate ligament in one of my knees (the same type of injury that football players are always getting.) I had surgery to fix my knee, but it was also discovered that I also had arthritis in my hips! My Mom took me to Kingsbrook so I could get some relief for my poor knee & hips! The first thing the doctors did was put me on a diet to keep me trim. Any extra weight I was carrying around was just making my joints hurt more. The diet they put me on is a new diet that has lots of Omega 3 fatty acids that help fight inflammation. They told me that dogs on this food alone often feel as good as if they were on pain medicine. But that wasn’t good enough for my mom! She wanted me as comfortable as possible. I also get a supplement called Dasuquin that helps protect the cartilage in my joints and a pain pill called Rimadyl every day (they even taste like a yummy treat, so I don’t mind taking them!) Another thing my Mommy does for me is give me injections of another supplement called Adequan. This also helps protect my cartilage and keeps my joints lubricated. Oh! I almost for got the best part! Part of my treatment is lots of walks with my Mommy. Not only do I enjoy my special time with her, but it helps build muscle mass to keep me going. I’m feeling so much better thanks to my Mommy & the doctors and staff at Kingsbrook! This entry was posted in Cruciate Injury, Hip Dysplasia, Joint Supplements, NSAIDS, Tiffani on March 28, 2008 by yourfriends. I’m Spike, and I live with my big brother. Can you see? I am lucky to have found such a wonderful home. He cares enough to take me to the doctor to make sure I am healthy and that I can’t fly around enough to get hurt. The doctor and technician helped me let my family know which perches are most comfortable for my feet and what foods are best to keep me healthy. 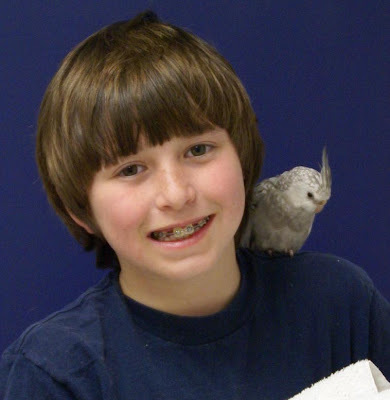 Did you know that all pet birds benefit from seeing their doctor each year just like you do? I plan to live a long and healthy life because I love my new family. Thanks big brother for taking such great care of me! This entry was posted in Cockatiel, Spike on March 25, 2008 by yourfriends. Setting a high standard of care for our surgical patients. At Kingsbrook Animal Hospital, we have 2 major goals we strive to achieve for our surgical patients. They are to minimize our patients stress and maximize their comfort. Your pet’s comfort and well being are at the heart of what we do. For our surgical patients, we achieve this by attaining as much information about our patients through thorough examinations and baseline blood work. We tailor our anesthetic and pain management protocols to meet the needs of each individual patient. 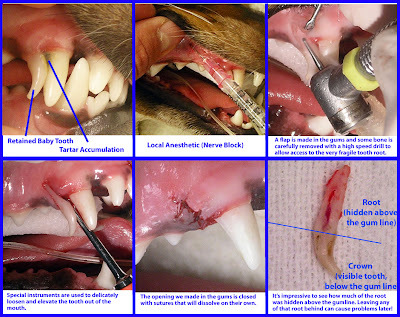 We have a very knowledgeable and educated staff of licensed technicians monitoring your pet’s physical parameters and comfort level not only during the procedure, but throughout the recovery period as well. We utilize intravenous catheters, circulating hot-water heating pads, advanced monitoring equipment and a multi-modal approach to pain management to aid us in keeping your pet safe and comfortable. Please feel free to ask one of our team members any questions you may have about the surgical process here at Kingsbrook Animal Hospital. This entry was posted in comfort, guiness, neuter, pain management, safety, surgery on March 24, 2008 by yourfriends. Robby, a handsome 11 year old Dutch Shepherd, worked most of his life as an explosives detection canine for the U.S. Pentagon Police. He recently retired, and now he enjoys his days detecting yummy treats and meeting new people. Thank you for serving our country, Robby. This biscuit’s for you! 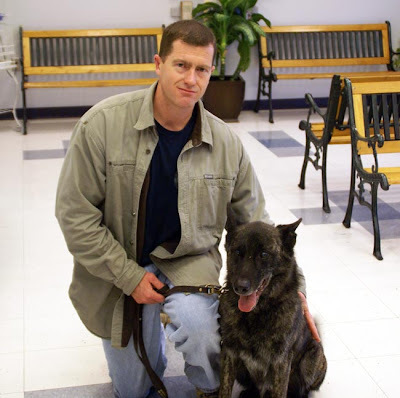 This entry was posted in explosives detection dog, police dog, robby on March 21, 2008 by yourfriends. Here are some of this weeks “New Arrivals.” It looks like a dog dominated week! 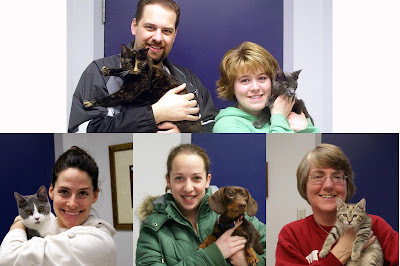 We’re so happy these little canines have found such wonderful homes! Congratulations! Top row, left to right: Checkers, Rocky & Marie Louise. Bottom row: Angie & Gracie. 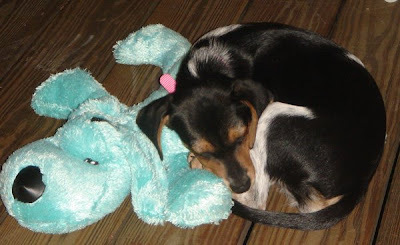 This entry was posted in Angie, Gracie, Marie Louise, new arrivals, Rocky on March 21, 2008 by yourfriends. Hi Everybody! 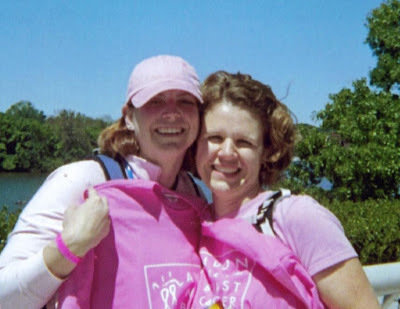 Just a little update on our endeavors to get ready for the 2008 Avon Walk for Breast Cancer. The weekend of May 3rd & 4th, Melissa and I will be walking just over 39 miles in two days. We will spend the night in a tent camp and shower in the back of a semi. Participating in the 2007 walk and being in the presence of thousands of strong and vibrant women coming together for a common cause was an experience that will forever remain in my heart and I look forward to doing it again. Melissa and I need your help to meet our fundraising goal of $3,600. We are grateful for any contribution to help fight this horrible disease. You can click here to read more. Our fellow technician, Ranee, has so kindly made 40 pairs of earrings featuring two Swarovski crystals surrounding a white lampwork bead with the pink breast cancer awareness ribbon. Ranee is selling them for $10.00 for a pair and all the proceeds go towards our fund raising efforts. Stop by the office to buy a pair (or two!) or click here to purchase them through ebay. A thousand “thank-you”s for your support! This entry was posted in Uncategorized on March 19, 2008 by yourfriends. Pippin the Master Earth Dog! Here’s to Pippin, who has just attained Master Earth Dog status! Just what is an Earth Dog, and can my dog become one? To find out more information on Earth Dogs, click here or here. It’s a lot of fun for them, and boy do they sleep well when they get home. This entry was posted in Earth Dog, Pippin on March 14, 2008 by yourfriends. Last September, a little mixed breed dog was presented to our hospital. It seems that someone saw fit to shoot him with a shot gun because this poor, homeless creature had the nerve to root through their trash looking for a meal. Frightened & in pain, “Watson” took refuge under a porch until an animal control officer could rescue him. The officer brought Watson to Kingsbrook Animal Hospital, where he could be treated for his injuries. Dr. Cook examined him and despite the pain from his injuries, Watson proved to be very sweet and gentle. X-rays revealed that he had multiple fragments of buck-shot deep in the muscles of his hind end (as seen in the image at the top-right, all of the white dots are the metal fragments from the shotgun injury). He was treated for his injuries, and hospitalized to make sure he would do well. The very next day turned out to be the luckiest day of his life! Eileen, one of our client service representatives, was the first one in to work. She found Watson in his cage, wagging his tail because he was so happy to see her. He was a little nervous at first, coming out of his cage, but once Eileen gave him some attention, he soaked it up like a sponge. 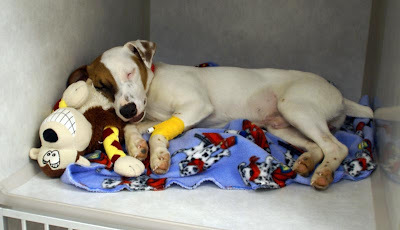 Later that day, Watson was taken to the Frederick County Animal Shelter in the hopes he would get adopted. Unfortunately, he was so scared that he wasn’t able to demonstrate his sweet and lovable persona. 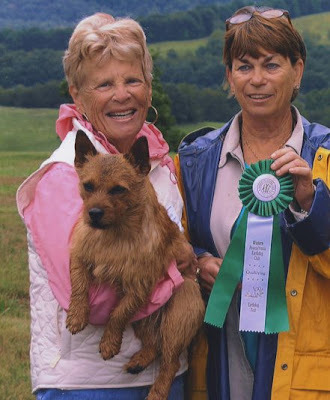 Eileen kept checking up on him, and when it was clear that his nervousness prevented him from finding a home while at the shelter, she decided to foster Watson herself. Watson is still with Eileen, she’s determined to show him that people can be kind, and that he will be cared for. His step-brothers Jake & Cannon are even teaching him how to retrieve! As you can see in the picture above… he even has to dress up for the holidays! This entry was posted in gun shot, watson on March 13, 2008 by yourfriends. My name is Heather, and I am an adorable 9-month old Beagle puppy. This past Wednesday was no ordinary day for me. My Mommy did not give me any breakfast and she took me on a car trip to Kingsbrook Animal Hospital. A field trip, I thought. No, Mommy had other plans; apparently an appointment for a tooth extraction had been scheduled for me. You see, all of my baby teeth fell out as I grew, except for the very stubborn right upper canine tooth. The Doctors and my Aunties at Kingsbrook informed Mommy how the persistent baby canine tooth was going to interfere with the position of my adult canine tooth. They also told Mommy that food particles would get stuck in the groove between the adult and baby canine teeth, causing tartar and making the gum tissue angry. It was true. My adult tooth did not have enough space and it erupted as a straight tooth, without it’s beautiful curve. I began to have yucky food particles stuck between the two teeth and boy, was my breath getting bad! It was becoming a real problem for me. So, my Kingsbrook Aunties made me sleepy with some sedatives and placed an IV catheter. They put me under general anesthesia and I don’t remember much after that. Dr. Davis later told me that he injected a local anesthetic agent to block the nerve around that tooth, then he surgically extracted my baby canine tooth. He showed my Mommy & me the dental x-rays of my tooth. Apparently, it is very important to take before and after x-rays to be sure nothing is left behind. He even sent me home with medicine to make sure I wouldn’t be in pain! I had no trouble eating my yummy dinner that night! Also, Dr. Davis gave me my baby canine tooth so I can put it under my pillow. He said the tooth fairy would take my tooth and leave me some money. Money? I don’t want money. I want a giant doggie biscuit! I will have to negotiate with the tooth fairy. I feel so much better without my stubborn extra tooth! So long my baby canine tooth! This entry was posted in baby tooth, beagle, Heather on March 12, 2008 by yourfriends.